It is the first time this prestigious international event has been held in Asia, and when entries open on February 15th teams from all around the world will begin their journey to this vibrant and welcoming country. Staging an expedition adventure race in Sri Lanka for the first time is an exciting opportunity which The Adventure Racing World Series are ready to grasp, and preparations are well underway for this huge undertaking. Over the coming few weeks a small team of the most experienced adventure race planners in the world are on location in Sri Lanka to fine tune the best possible course, prepare for the slickest and safest delivery of the race, and meet with vital event partners. Organising an expedition adventure race is as challenging as completing one, maybe even more so! The AR World Championships is unlike any other race in the world of sport in both its scope and its complexity. The opportunities start with a whole country full of amazing scenery and historic and cultural locations to pick from for the course, but they need to be joined in a coherent way and include the key disciplines of trekking, cycling, paddling and navigation. The course has to fit in with Sri Lankan day-to-day life locally, and work within national laws and regulations, particularly as regards conservation and environmental regulation. There are cultural considerations too and the advance team are not only meeting with senior government and military officials in the coming days, they are due to receive a monks blessing at religious site which may well feature on the course. The whole process is one giant adventure jigsaw puzzle and the advance planning team has to fit the pieces into place. The team is lead and coordinated by Craig Bycroft and Louise Foulkes, Directors of the AR World Series, who have pulled together a dream team of organisational skills and experience from races all around the world. The pair have managed the AR World Series across 6 continents for many years now and planned and staged two previous World Championships. Bycroft will be the Race Director and Foulkes will manage the media and live coverage of the event. With them in Sri Lanka is the Course Manager, Igor Dorotic, who is Race Director at his own AR Croatia race. (This takes place in September and very quickly sold out after high praise of the course and planning at the inaugural race last year.) He is also a senior ARWS referee with experience of many other races around the world, is a mountain guide and climbing instructor, and has been organising orienteering events for over a decade. 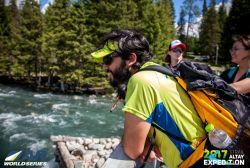 Lopez has also staged a previous World Champs in his home country of Ecuador (2014) and has organized more than 170 outdoor events as a Director and founder of Proyecto Aventura. Brad Baumber is the race Medical and Communications Manager and he the final member of the advance team. He is a helicopter paramedic from Canada and has worked on three previous AR World Championship races, making sure the communications and medical cover network is in place to support the teams. The team will be having meetings and briefings (and blessings) in the next couple of weeks and will be trekking, paddling and riding in the mountains and along the coastline of Sri Lanka as they piece together the World Championship course. ARWC 2019 Entries Are Open!